For most people with chronic diseases such as epilepsy, thorough knowledge of the disease is important in order to reduce feelings of insecurity and to enable better management of everyday life. 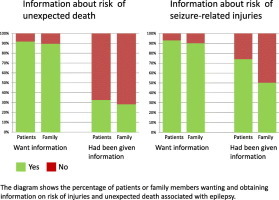 Whether and when to inform patients and their families about all the risks associated with epilepsy is a matter of controversy.Using a web-based survey, patients with epilepsy (PWE) (n=1183) and carers, family members, or guardians of PWE, who could either answer on behalf of the patients (CBP) (n=676) or on their own behalf (CAR) (n=231) were asked whether they wanted information about the risk of epilepsy-related injuries and premature death and also whether they had received such information.Ninety percent or more of PWE, CBP, and CAR reported that they wanted such information, and 50% of CAR, 81% of CBP, and 70% of PWE had received some information about seizure-related injuries. Regarding risk of unexpected death, 31% of PWE, 35% of CBP, and 28% of CAR had received information on this issue. Those with tonic–clonic seizures were most eager to obtain information on these matters, and those best informed about epilepsy-related risks were males and the youngest part of the cohort. The wish for more information or the likelihood of having already received information was independent of the individual’s seizure situation.This study demonstrates that there is a considerable gap between what the patients want regarding information and what they are actually given by healthcare providers.